"This Has Only Happened Twice In History" - Goldman Asks "Should We Worry?" Toward the end of the third quarter, as the VIX was plumbing new all time lows - a trend that has largely persisted ever since - we reported that in the latest striking development involving volatility derivative products, the total outstanding Vega across the entire levered and inverse VIX ETP space had reached $375 million, an all time high. This, as Bank of America showed at the time, was the result of the highest positioning in levered long VIX ETPs since July 2016 offset by a record high exposure across short ETPs. And while the surge in long vol ETFs vega is something that had been duly documented since 2016, the offsetting move by inverse VIX ETPs - a preferred trading instrument used by retail investors and for institutional hedging - was certainly a novel development. Fast forward a few months to the first week of the new year, when Goldman's new derivatives strategist Rocky Fishman, who until recently toiled at Deutsche, followed up this observation and highlights that, in an acceleration of the move we first observed last September, "the net position of VIX ETPs has become short over the past few weeks, for only the second time in their eight year history." 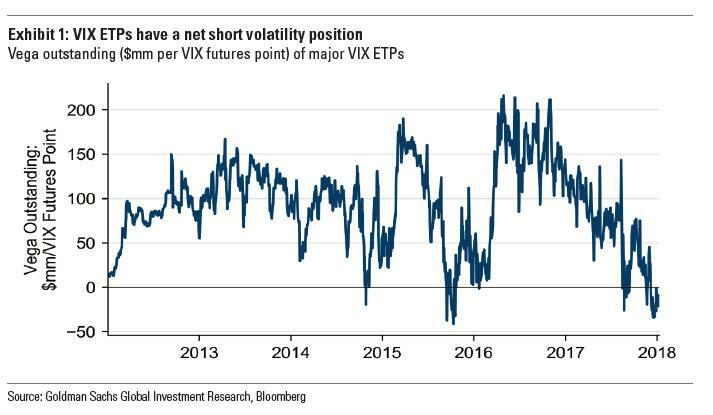 This odd finding - namely that VIX ETPs are now net short vega as shown in the chart above, prompted the Goldman strategist to ask glibly "Should we worry?" The reason for Fishman's concern is that the recent increase in AUM in Inverse VIX ETPs has raised concerns - both at Goldman and elsewhere - that investors in these products are likely to amplify fundamentally driven moves in VIX and VIX futures. The Goldman analyst then notes that while some, like Barclays previously - may view this as excessive risk taking, he is "less worried about this net number and more concerned about inverse and levered products’ flows that would be generated by a rise in VIX futures." The reason for this is that as Fishman explains, "the shift toward negative net vega has happened for passive reasons: the shares’ strong performance (XIV up 185% in 2017) has left each share of the XIV and SVXY with 50% more VIX futures exposure than it had three months ago, offsetting net outflows from the products." The negative Vega is further confounded because as Goldman calcualtes, short VIX ETPs actually had net outflows in 2017 despite their strong returns, as investors took profits on rising share prices. Meanwhile, "long VIX ETPs drew inflows as investors replenished shrinking positions." Another surprising observation: "although VIX ETP-related activity continues to dominate VIX futures usage, CFTC reports show that the “Leveraged Funds” (primarily hedge funds) category now has a short VIX futures position that is not explained by VIX ETP positioning." In short, and pun not intended, we now have confirmation of what we have long suspected, namely that both retail investors - such as the wildly famous former Target manager Seth Golden, and hedge funds, are now net short vol to an unprecedented degree, something also shown in the chart below. Incidentally, this also validates the thesis presented in November by Fasanara Capital, according to whom "It’s Now All One Single, Giant $22 Trillion Position" whereby everyone is directly and indirectly short vol in one giant trade. Given the low starting point of the VIX, these strategies are at risk of catastrophic losses. For some strategies, this would happen if the VIX increases from ~10 to only ~20 (not far from the historical average level for VIX). While historically such an increase never happened, we think that this time may be different and sudden increases of that magnitude are possible. One scenario would be of e.g. VIX increasing from ~10 to ~15, followed by a collapse in liquidity given the market’s knowledge that certain structures need to cover short positions. Putting this in context, just a 3-point spike in the VIX would force some $110 million vega to buy. This goes to Fishman's original question whether "we should be worried" because it represents double the highest ever seen before 2017 and "would be around 60% of daily 1st/2nd VIX futures volume, and around 30% of open interest." When volatility rises, both inverse and levered long VIX ETP issuers are economically driven to buy VIX futures: the inverse product issuers doing so to reduce a short position that has become too large, and the levered issuers to supplement a long position that has not risen as quickly as the ETP itself. Wrapping the Goldman note, its troubling conclusion should hardly come as a surprise, as it is something we have discussed extensively over the past year. According to Fishman, the biggest concern as a result of this historic net vega short, "is a one-day, end-of-day vol spike." "VIX ETP rebalancing would be most impactful should there be a quick SPX selloff near the end of a trading day, pushing issuers to rebalance positions quickly to avoid unhedged overnight risk (ETN issuers) or excessive tracking error (ETF issuers). With the rebalancing need primarily driven by inverse products instead of levered long products, a multi-day volatility spike (e.g. VIX futures rise 1-3 points for several days in a row) would be less impactful than it would be with more levered long product open interest, since absent inflows the inverse products would shrink quickly on an initial vol spike (and their vega-buying is limited to the total position they are currently short)." If this sounds familiar, it is because Fishman has loosely paraphrased an almost identical observation made by Barclays several months ago, which warned that the key risk, "is that of a “one-two punch” scenario which unfolds in two phases." In the first phase VIX spikes moderately due to adverse fundamental news and then stabilizes for a few days at an elevated level. The VIX ETP investors follow their play-book of selling volatility expecting a mean reversion. However, if at this point, the fundamentals were to deteriorate further, it would create an air-pocket phenomenon where the subsequent spike in VIX could be amplified." Of course, that "air pocket" scenario is just the waterfall analysis that Morgan Stanley put together back in July when it previewed what could happen to the VIX ETP sector, and the market in general, "If The Vix Goes Bananas." [O]n balance the total demand from VIX ETP managers is likely to be higher relative to a few weeks ago and is a significant source of risk especially during a large fundamentally driven shock. The only caveat we would keep in mind is that the volume in VIX futures is likely to cross $1Bn vega during a shock scenario. Since then - as Goldman shows - the total demand "to buy" VIX in case of a market shock has only soared as net Vega has sunk to historic lows, and is now effectively tied for the highest ever. But what is scariest is that the longer the current low-vol regime continues, the greater the negative vega, and the smaller the distance the VIX would need to rise before forcing a volatility squeeze: back in June, it would only tax a 5 vol VIX spike to result in a selloff; since then the number has declined to only 3; at this rate a VIX move of just 1 by the summer of 2018 would be all it takes to launch a waterfall cascade in risk assets. As volatility has declined, investors have had to sell even more of it to sustain sufficient profits. This selling reinforces the trend lower, which produces an illusion that legacy volatility shorts are less risky today than yesterday. Lower volatility thus begets lower volatility. And this also ensures that quantitative models reduce overall portfolio risk estimates, which allows (and in many cases forces) investors to buy more assets at prevailing prices. 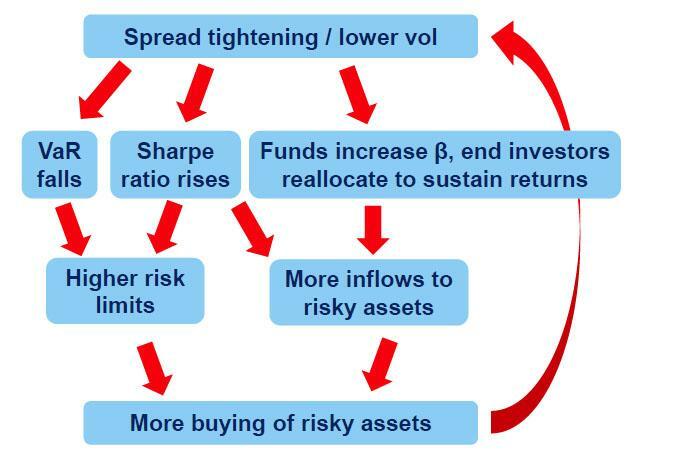 This in turn reduces volatility, reflexively. Naturally, the reverse is also true. Rising volatility begets rising volatility. And given the unprecedented volatility-selling in this cycle, this market is exposed to a historic reversal somewhere along the path to policy normalization. Which has now begun. So far, this feedback loop envisioned by Peters of constantly declining volatility has worked without a glitch. Just one question remains: what is the catalyst that finally breaks it, and send the VIX surging and market tumbling in the inverse feedback loop? And while neither we, nor anyone else, knows the answer with certainty, we will shortly reveal several potential tipping points that finally push the market away from its current state, which Fasanara Capital defines as the "edge of chaos" and into its next, far more volatile, phase.